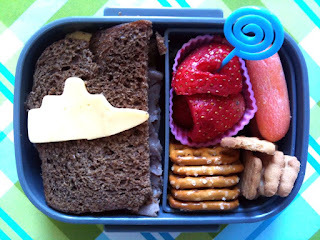 BentoLunch.net - What's for lunch at our house: The Kids Cook Monday - Faith Made Bentos! The Kids Cook Monday - Faith Made Bentos! As mentioned, I spent the weekend in Austin while F&B stayed home with Daddy. While I was driving back, I called and discovered that they were making lunches. Faith decided that, instead of normal lunches, that she was going to make bentos, set them up, have Shaun photograph them for her (iPhone, sorry about the quality, I had the cameras with me), and that I was going to blog them for The Kids Cook Monday. Faith made roast beef & cheese sandwich on pumpernickel rye, topped with cheese flowers. She has strawberries, carrots, little honey graham bear cookies, pretzels and some peach yogurt. She did a pretty good job for 8! I am loving how she had to use picks and decorations to make it pretty. We were standing in the kitchen and I decided that I was going to make lunch. I had it on the plate but then decided that I was going to make a bento. Then I looked around the kitchen, trying to decide what I was going to do and then I remembered that Mommy puts cheese on the sandwiches so I cut the cheese into flowers and a boat. And then I remembered that she used picks, I used the Halloween ones, but then I decided because the cheese was flowers and was different, I decided I would use some swirls. And I had lots of fun making it. The end. Wowee! 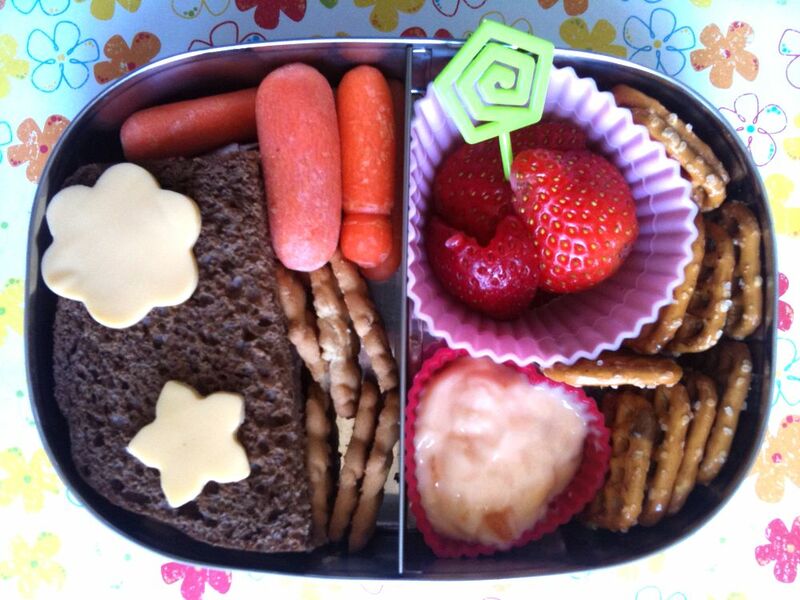 Faith has some mad bento skills! These are really well done. I like that she arranged the pretzels and cookies in order. It's a simple trick that really works to make a bento look visually appealing. Great job, Faith! Wow Faith I am so impressed!!! You must have felt really proud of yourself after making those yummy and cute lunches! You are living proof that it pays to cook with kids...look at what you can do!!!! Way to go Mom for doing such a great job of teaching your cuties the joys of cooking. Sending you a big cyber high 5 Faith:) I can't wait to see more of your bento lunches!! This is absolutely amazing and Faith I am SO proud of you. You did an absolutely eye catching healthy lunch! Good for you....now the puppies want to know if you could do the same for them? Oh, my gosh, wonderful! Please tell Faith all us moms out here in blogland are so proud of her. Hers are way better than mine! She is taking after her Mom for sure!